World leaders at the MDG Success event at UN Headquarters in New York during the 68th Session of the UN General Assembly. The Millennium Development Goals (MDGs) were set forth by the United Nations (UN) in 2000. At that time, nations around the world agreed to take action and reach target goals by 2015 to reduce poverty and improve health, education, women’s empowerment, and the environment, all of which are embodied in the eight MDGs. 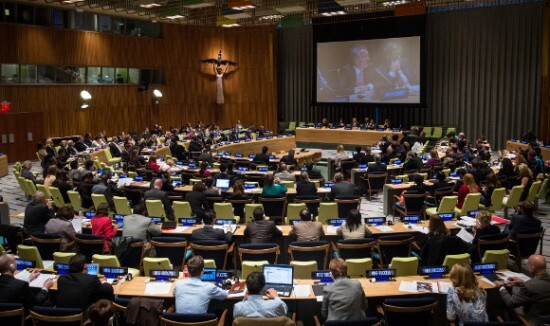 In September of 2013, the UN General Assembly hosted a special event to assess progress made among nations. Most countries won’t make it to the finish line in 2015, yet great strides have been made on fronts such as maternal and child health and the control of HIV/AIDS, tuberculosis and malaria. More notably, under-five child deaths (MDG4) have dropped from 12.6 million a year in 1990 to 6.55 million a year in 2012. Global maternal mortality (MDG5) rates have been cut in half, from more than half a million every year in 1990, to 260,000 in 2013. Significant progress has also been made in achieving MDG6: the rate of new HIV/AIDS infections has dropped by 30 percent across the globe while 9.7 million people in poor countries are now on treatment, representing nearly 30 percent of the reckoned global HIV/AIDS population. Of all the MDGs, the target of rolling back malaria seems to be most within grasp, thanks to global distribution of insecticide treated bed nets and artemisinin-based treatments. Ray Chambers, the U.N. Secretary-General’s Special Envoy for Malaria, is optimistic that malaria deaths could be brought to “near-zero” by 2015. That said, funding continues to be a major challenge in attaining the MDG targets. The World Bank estimates that, if countries improve their policies and institutions, they need additional foreign aid of $40-$60 billion annually to reach the MDG goals by 2015. The Global Fund to Fight AIDS, Tuberculosis and Malaria and the President’s Emergency Plan for AIDS Relief (PEPFAR) have already spent tens of billions of dollars on the global campaign against HIV/AIDS. Still, most people living with HIV or at risk for the virus do not have access to prevention, care, and treatment. To move countries closer to the MDG goal finish line, Ray Chambers was appointed last year as the UN Special Envoy for Financing of the Health Related MDGs, and was charged with securing funds from the public and private sectors to continue the effort to achieve the MDG by 2015. Chambers brings with him 25 years of philanthropy and result-driven experience in global health. A co-founder of the charity Malaria No More, he has been the UN’s Special Envoy for Malaria since 2008. In that capacity, he has overseen an effort that raised over $5 billion and distributed more than 400 million mosquito nets to cover over 800 million people. 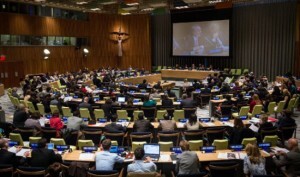 Last September, Chambers announced the mobilization of $1.15 billion to reach MDGs 4 and 5, which was the largest amount ever committed for those goals. These funds, in concert with the $2.6 billion from the London FP Summit in 2012 and pending $15 billion Global Fund replenishment, amount to more than $18 billion, a number that demonstrated a sense of global responsibility and commitment to make the world a healthier and safer place. They represent the new frontier of global health financing. The unique alliances between governments, financial institutions, and the private sector can be the key to successfully funding the critical health services of today for the health of tomorrow’s generation. Courtney Page holds an MPA and MA from the School of Diplomacy and International Relations at Seton Hall University, and teaches in the University’s Department of Political Science. Yanzhong Huang is an associate professor and director of the School’s Center for Global Health Studies and founding editor of the scholarly journal Global Health Governance.